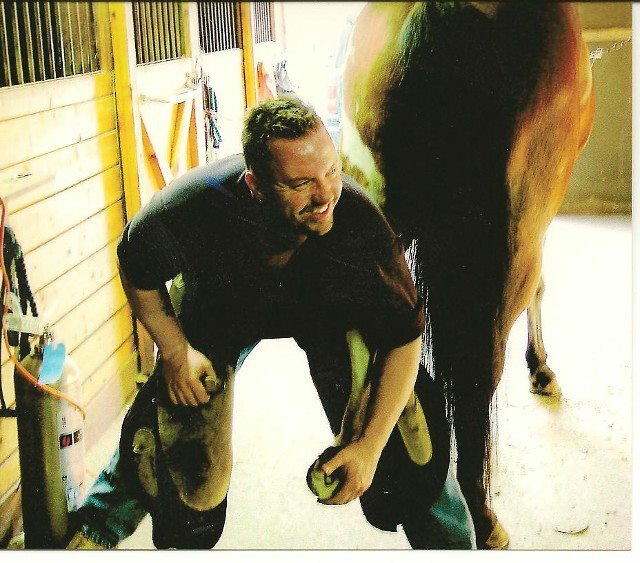 I have been shoeing horses since 1994. I became an A.F.A. Certified Farrier in the fall of 1996. I apprenticed with many professional farriers along the way. I served on the board of directors for the Southern New England Farriers Association, twice. I also spent many years competing in forging contests, and attending clinics and symposiums on every aspect of hoofcare. I shoe for many different disciplines: Hunter/Jumper, Dressage, Eventers, Western ... I've seen and done it all. I am a very patient and caring farrier. I enjoy taking the time to get to know your horse, and earn his or her trust. I don't "hurry my way through" my appointments. I pride myself on being punctual and dependable. I always return texts, emails, and phone calls in a timely fashion. I show up on time for my appointments. I deliberately don't overbook, so that there's never a rush. If for some reason I am delayed, I will call you. I am dedicated to providing you and your horse with superior hoofcare. "YES" I will come out to smaller barns. I have many small "backyard" barns in my practice. I am also a U.S. Army veteran. I served as a forward observer with the 3/8th Cavalry in Mannheim, FRG, along with the 75th Ranger Regt, and 10th Mountain Division, both at Ft Benning Ga.